With Valentine's Day not too far off, now is a great time to be thinking of what to send this year. The Affectionately Yours Classic Card Kit is perfect for the event. Today we're sharing one of the card samples created for this kit with you. The kit samples are a great way to see the kits and Maya Road product in use and our designers always have fabulous ideas and techniques you'll want to try. If you haven't visited our kit galleries, there's a lovely little tab just under the blog banner or click on this link for quick access. We love this sweet card by Julia Stainton...it's certainly full of love. Everything to make this card is included in the kit, all you need are a few basic tools such as a paper trimmer, heart punch and some brown ink if you like the distressed look on the edges. Cut black damask paper to 4.25"x5.5" and adhere to card front. Ink edges if desired. Punch 6 hearts from various patterned papers from the kit. Apply adhesive to back of 5 hearts and arrange in glassine envelope. Fold top of envelope over and fix with arrow clip. Adhere remaining heart to front of glassine bag where you want the stitching. Use a removable adhesive. Stitch around heart on sewing machine. For accuracy lift presser foot and pivot with needle in down position. Reapply presser foot and continue stitching. Doing this often will allow for smooth intricate curves when stitching. Adhere glassine envelope to card front. Tip: apply adhesive where it won't be seen under the punched heart areas. Cut out xoxo paper accent from patterned paper sheet. Ink edges and adhere under arrow clip. Tie ribbon bow around arrow clip. Adhere love flair button with hot glue or strong adhesive dot. It's the time of year where we like to warm things up with a little love. 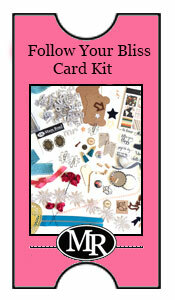 At Maya Road we're excited about our new Classic Card Kit, Affectionately Yours. It's perfect for Valentine's and throughout the year with it's fabulous stamps and embellishments. Whether you're celebrating the love of your life, a new couple saying I do, family love or the beauty of friendship, this is the perfect kit to create memorable and heartfelt cards. Affectionately Yours has all you need to create 6 cards (and more). Envelopes, papers, trims, stamps, flair and fun exclusives make it easy to just open the package and get creating. All our kits are limited edition so if you want it, make sure you purchase it right away. Quantities are limited. We're excited to have put together such an amazing kit of fabulous product. Each kit has been designed for versatility, amazing value and ease of use. It's a wonderful way to jumpstart your creativity. Just open the package and get to it. If you're looking for extra inspiration we have a kit gallery full of ideas to get your started. Check it out here. Each kit is $25.49 and a flat $5.50 shipping in the US! Our Affectionately Yours Kit Add-ons. So many of the products in the Autumn Notes are just so wonderful we thought you might want to be able to purchase a few extras. Purchase any or all of the add-ons at the same time you purchase the kit and we'll mail them at the same time with no additional shipping charge! Neenah Papers are among the best in the industry for stamping on. Each kit includes one half sheet but we know many of you stampers will like to have some on hand for additional projects. Our add-on package includes an extra 8 half sheets for your to create with. We love the glassine envelopes. Each add-on package has 10 envelopes that you can use on card fronts, to hold special items or even mini cards. Each envelope is 3" x 6" and exclusive to our Maya Road Classic Card Kits at this time! This Love Notes paper pad is so much fun you may want to purchase extra. We love the beautiful prints and great color palette. You are going to want this add-on! We are head over heels in love with the Rose Lace Tape and darling flair buttons. We're having a love affair with metal clips and these are some of our favorites. This gorgeous flower confetti is an exclusive you are going to want more of! Join us on our creative journey with Maya Road Classic Card Kits and our January release, Affectionately Yours. It's release day at Maya Road Classic Card Kits! We're excited and counting down the hours till the Affectionately Yours release at 8 pm CST tonight. It's not long now! Maya Road is known for our fabulous trims and this kit is chock full of them. The variety is wonderful. From jute to twine cording, striped grosgrain to burlap, this kit will have your projects all trimmed out. Did you see that beautiful lace tape? It's high on our list of personal faves! To give you an idea of what you can create with this kit, here's one last peek at one our creative designs. Our full Affectionately Yours card creations gallery will go live tonight with the release so that you'll have lots of ideas to inspire you along with the kit. One of our favorite parts of each Maya Road Classic Card Kits is the exclusive stamp set. This one is no exception and is a wonderful mix of fabulous sentiments and images. We've designed this set to be used in so many ways throughout the year and all the images work together seamlessly. Maya Road stamps are made with the highest quality photopolymer ensuring crisp beautiful stamped images, easy stamping placement and a set that will last and last. As previously mentioned...this stamp set is exclusive to the January Affectionately Yours Kit. That means you won't be able to get it anywhere else. Affectionately Yours is available for purchase Friday January 3rd at 8 pm CST. That's tomorrow! Which stamp is your favorite from the sneak peeks? We'll be back tomorrow morning for one last sneak peek before the release tomorrow night. See you then! Happy New Year from all of us at Maya Road! We're excited with all the possibilities of a fresh new year. We'd like to wish you and yours a year of joy, health and peace. At Maya Road, we're planning a wonderful year of creativity for 2014 and hope you'll join us. Our latest Classic Card Kit, Affectionately Yours, is a great way to start off the year with a stack of beautiful card creations to share with your loved ones. We have a special guest designer for this kit release and are excited to share some of her designs as today's sneak peek. 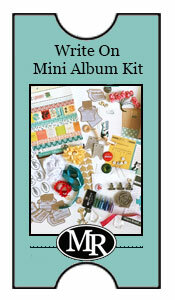 This kit has tons of product and exclusives in it...enough to make 6 cards and lots of other projects as well. Today we have an extra sneak peek as well. These metal Maya Road arrow and love clips are super sweet. Look closely and you'll also see a muslin bag and a peek at our exclusive floral confetti. Got a crush on Affectionately Yours yet? This January kit is available for purchase Friday January 3rd at 8 pm CST. Just a couple more days! Ready for another sneak peek of our latest kit? Today we have a little peek at one of the projects created with some of the Affectionately Yours kit contents. I spy fun chipboard, fabulous stamps, stunning trim and beautiful prints! If you're new to Maya Road Classic Card Kits, be sure to check out our FAQ page for more details. Are you falling in love with Affectionately Yours? Our January kit is available for purchase Friday January 3rd at 8 pm CST. Just three more days! At Maya Road, we're gearing up for our latest kit release, Affectionately Yours. With a stunning array of embellishments, beautiful papers and exclusives, we know you're going to love it as much as we do! Affectionately Yours is perfect for Valentine's Day and also for staying in touch with those you love throughout the year. How about a sneak peek? This beautiful exclusive flair is part of the latest kit. Don't you love that chalkboard style love banner and the darling typewriter? So sweet! You'll also find red dotted envelopes, pretty cording and lovely kraft heart stickers. This is just the beginning so stay tuned! We'll be back with more previews tomorrow! Affectionately Yours releases this Friday January 3rd!